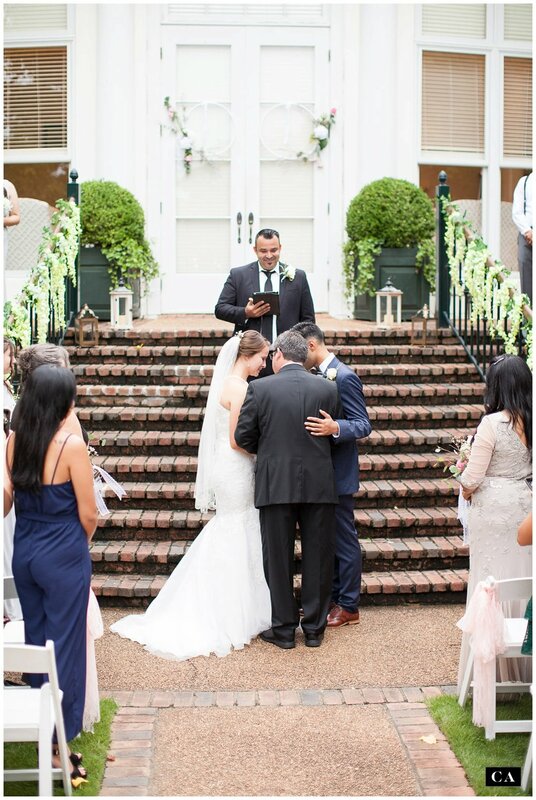 Y’all, I enjoy every single one of our weddings, but let me just say, Tacia and Gabe’s June wedding at Old Waverly Clubhouse is one that I would relive over and over. 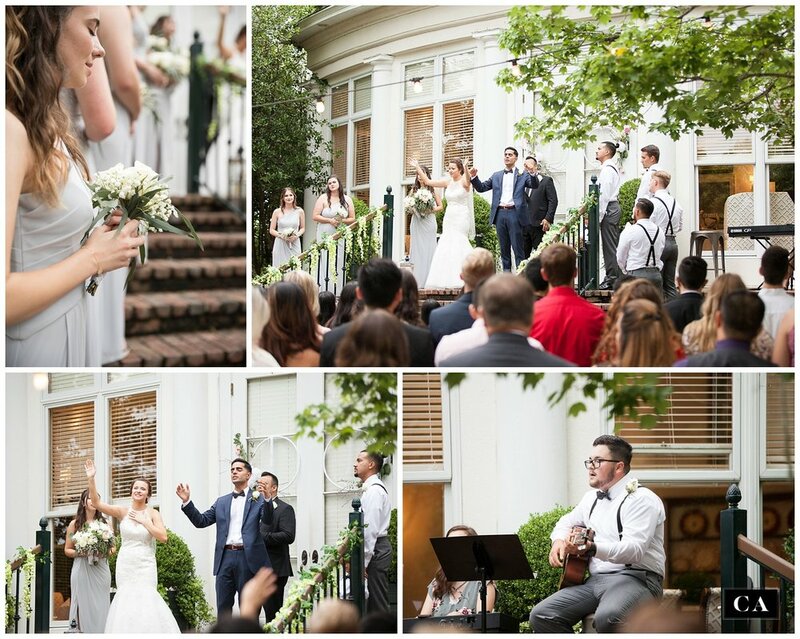 Not just because of the beautiful venue, although Old Waverly is one of my favorite wedding spots in our area. Not just because of the miraculous weather - it was JUNE, y’all. In MISSISSIPPI. We had a big chance of rain that day! And it never rained on this sweet wedding - not one drop! And you know what the high temperature was that day? 80 degrees! 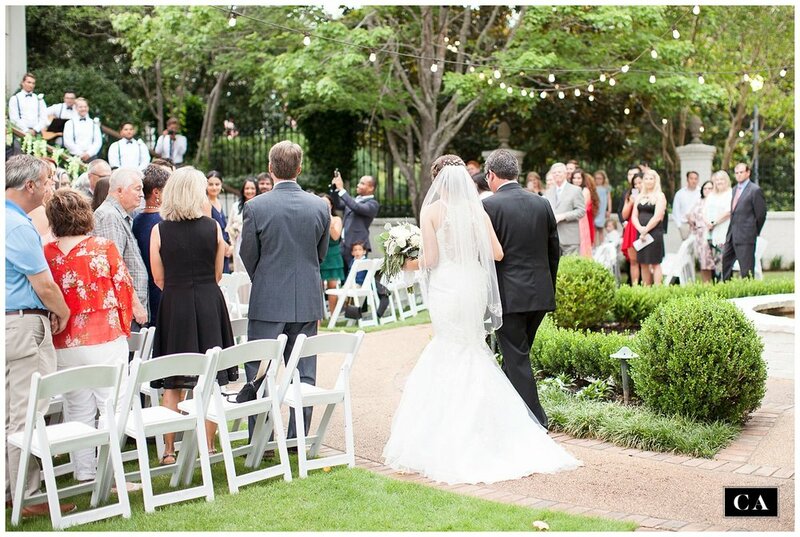 It actually felt cool and breezy most of the day, which was PERFECT for this garden wedding! I’d relive this day over and over not only because my favorite vintage VW Bus got to play a special part in the day. And not just because Tacia and Gabe’s First Look moment was one of the sweetest I’ve ever seen. 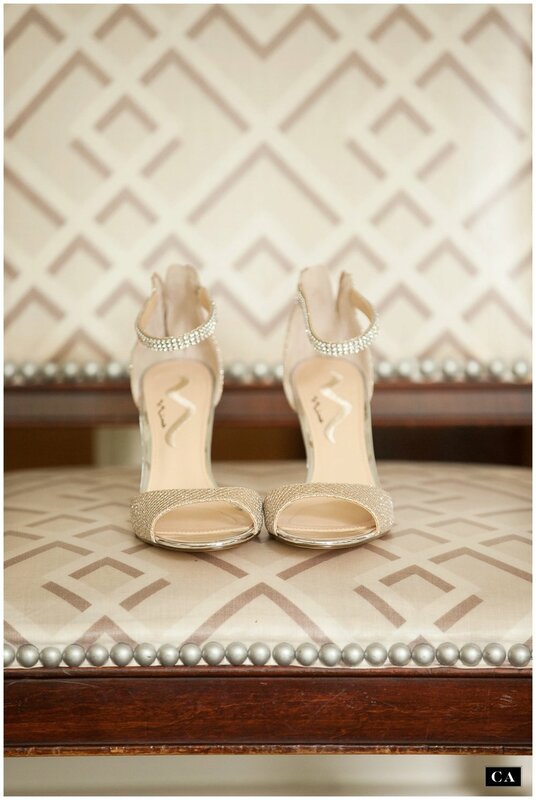 And not just because this wedding was a perfect blend of elegant and playful. I’d relive this happy day because JOY was allowed to run free at this wedding! God’s love and faithfulness was celebrated, family and friends were honored, and everyone let their happiness for Tacia and Gabe just bubble out all over the place. And y’all, don’t even get me started on the dancing that night! It was like a little bit of Miami AWESOMENESS right here in sleepy little Columbus! And it was AMAZING!! When I think of Tacia and Gabe’s love story, there’s so much I want to say. I think of how Gabe honored Tacia by slowly building a relationship with her based on respect and prayer. These two met at ministry school at Highlands College in Birmingham, and they started out as just friends. It wasn’t long before Gabe knew there was something very, very special about Tacia, and he asked her out on a date - but she said no! Tacia wasn’t sure if she was ready for a relationship, and at Highlands, dating isn’t encouraged the first semester. Even though Tacia said “no” to him at first, I LOVE how Gabe showed his maturity and respect for her in his reaction. He was understanding of her feelings, and he was willing to wait. How many young men can handle a “no” with so much grace? Keep reading, y’all…. He told her how much he admired her heart for God and her passion for ministry, her talents, her hopes and dreams. He made her feel valued for WHO she is, not HOW she looks. When she shared that story with me, I immediately understood why everyone in Tacia’s family who met Gabe pretty much instantly loved him! Before you scroll on to have a front row seat at their joyful First Look, let me tell you one more thing about their beautiful courtship. On December 15, 2016, Gabe did something so incredibly respectful and romantic: he asked Tacia’s dad for permission to date her! They dated for one year. Can you guess what happened one year TO THE DAY later? Now let’s talk about this amazing First Look. From the beginning, Tacia and Gabe told me one of the things they were MOST looking forward to on their wedding day was their FIRST LOOK! As a wedding photographer, that makes me SOOO HAPPY to hear! I know that when both the bride and groom are that excited, it will truly be a magical experience for them. Tacia and Gabe also wanted plenty of time for relaxed, natural portraits together. Since this was such a big priority for their day, we spent a little extra time at the rehearsal scouting the best locations, and they set aside PLENTY of time for their portraits. And as you can see below, that little bit of extra planning and time gave them an incredibly special memory together! I’d had a preview of the tender, spontaneous, and passionate energy these two have together when we had their engagement session, but y’all…. their First Look was full of so much delight, tears, laughter, and joy, it’s one for the ages. It was truly an honor to be one of the few witnesses to this moment, a moment built on a foundation of hope, answered prayer, and patient waiting. At this point I have nothing to say, except it’s moments like this that remind me I have the best job in the world. 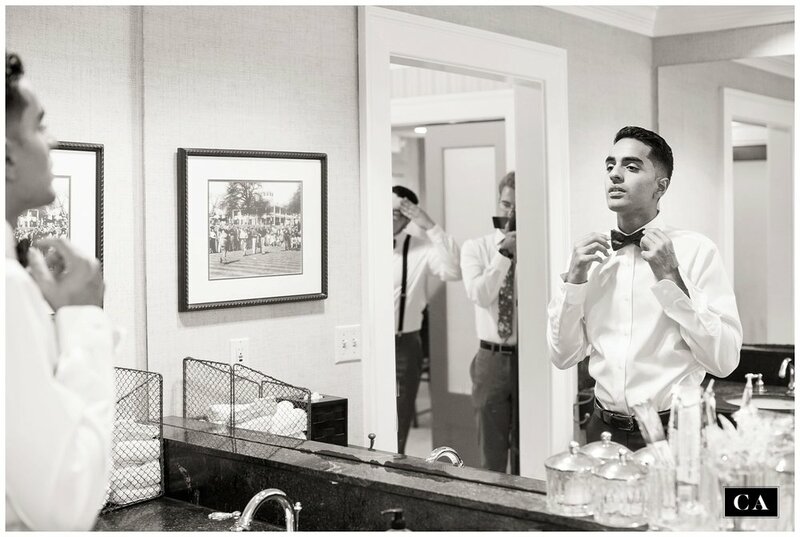 If you’re reading this and planning your own wedding day, and you’re wondering “how on earth did they get so many beautiful portraits?” The answer is that they gave themselves TIME. Sweethearts, it’s worth it to get up a little early on your wedding day so you can have a special time set aside for just the two of you. You have the rest of your life to sleep in! 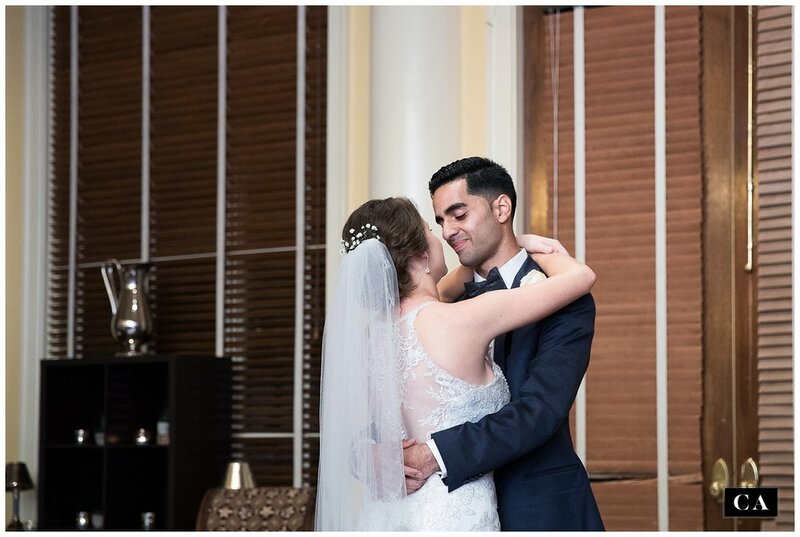 So much of your wedding day will seem to fly by, so don’t be afraid to set aside an hour or even an hour and a half for just the two of you to spend together! 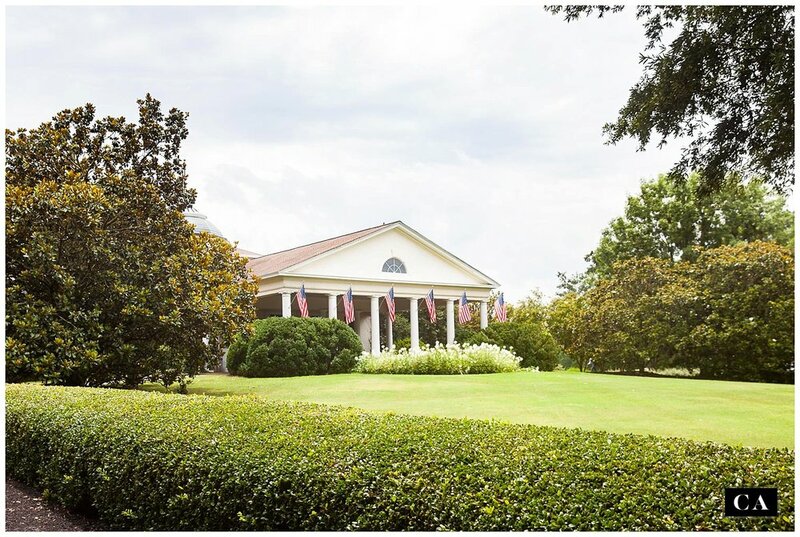 Especially if you have chosen a gorgeous venue like Old Waverly - there are so many lovely spots to visit here. Remember how I said that this wedding day was just full of JOY? Here’s proof! As we were finishing up Tacia and Gabe’s portrait time, I heard happy screams behind me! 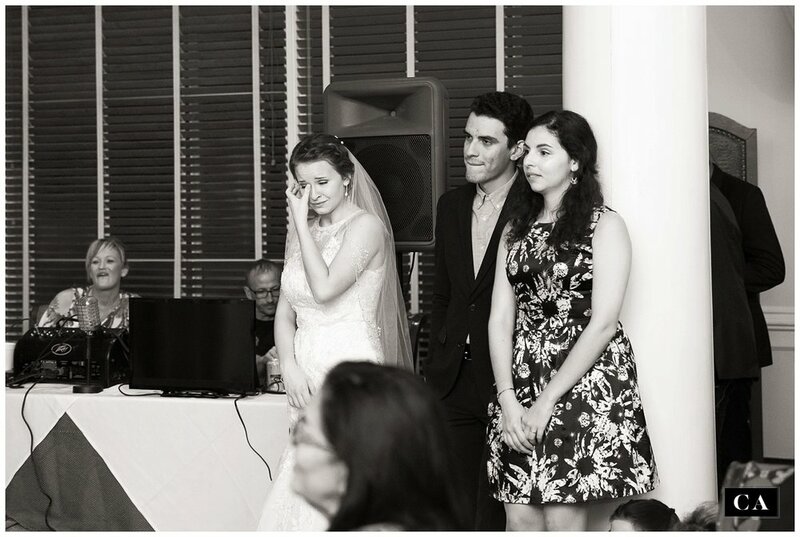 I turned around and caught the bridesmaids’ reactions to the moment! 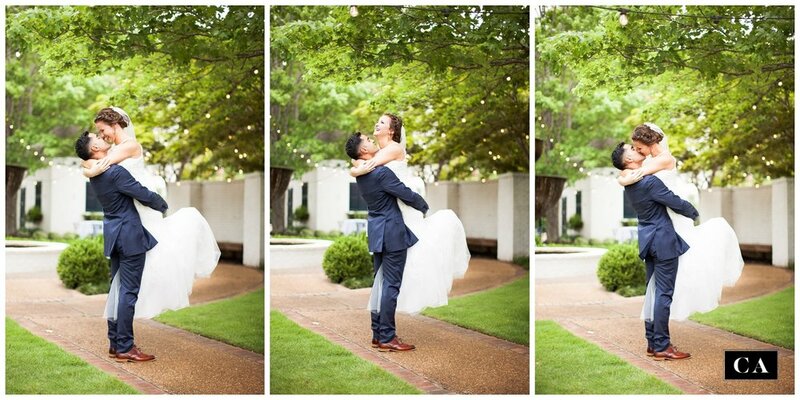 These are some of my FAVORITE images from the day, because they just capture the energy of the day so perfectly! Summer is one of the most beautiful times of the year at Old Waverly Golf Club! The magnolias are blooming, and the courtyard is shady and peaceful in the evening. 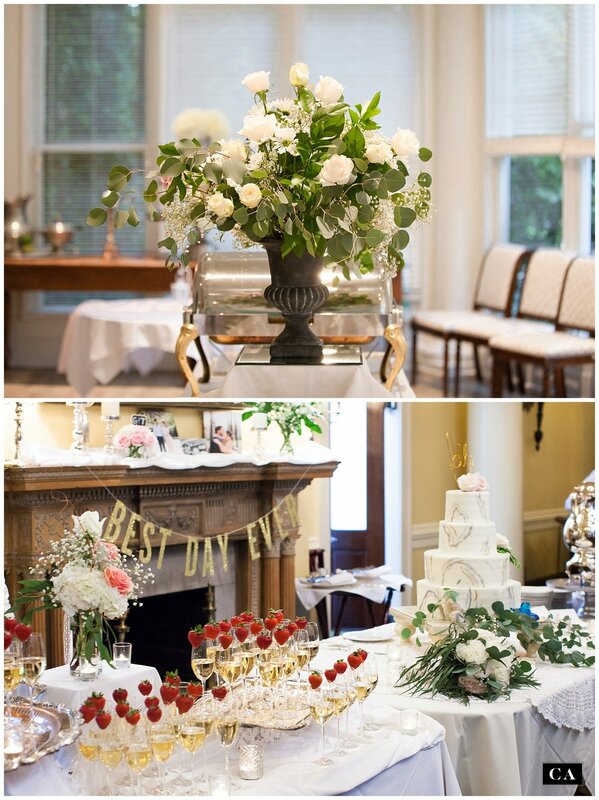 Tacia and Gabe personalized their happy day by adding so many personal touches to the beautiful setting. 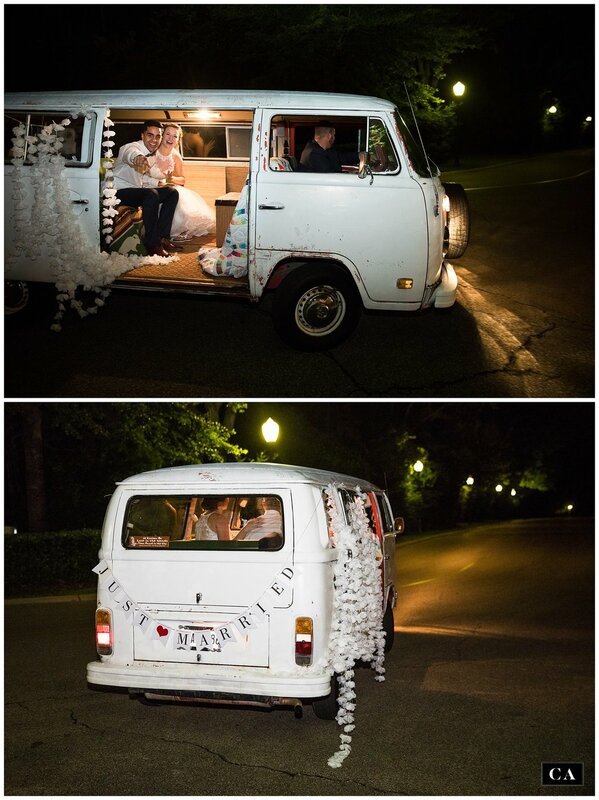 Tacia’s family’s vintage Volkswagen Bus became a fun photo booth, and welcomed guests at the entrance. 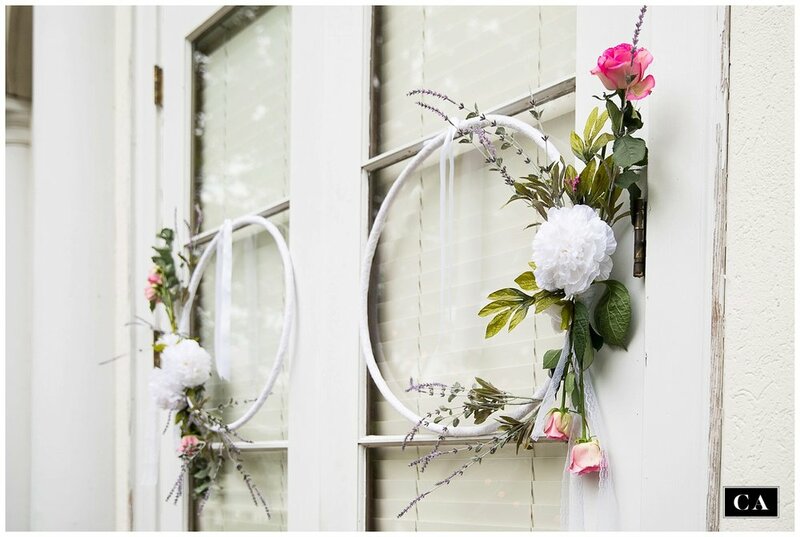 Friends and family helped with the floral decorations inside the Clubhouse and in the courtyard. Friends helped create beautiful signs. 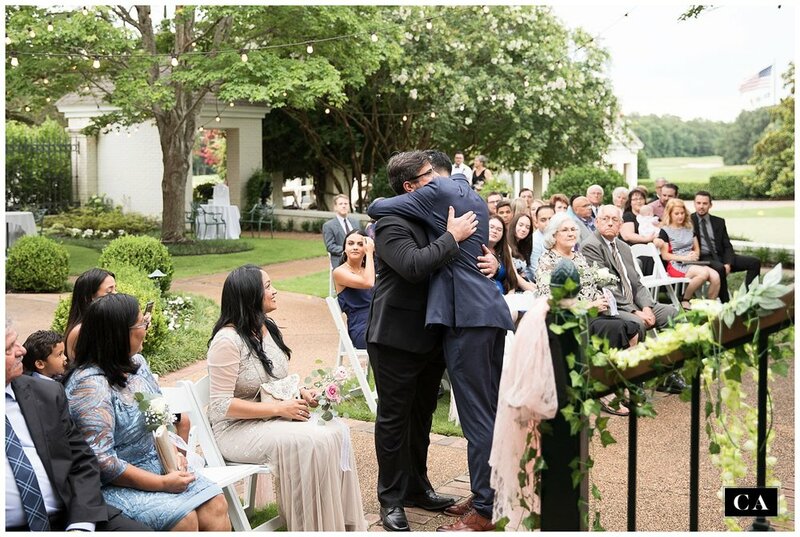 And one of the sweet surprises of the day was when Gabe’s family surprised them just before the ceremony with a wonderful heart-shaped frame that guests could sign as they entered the garden. What a wonderful gift! Another thing I love about summer in the south - the evenings seem to last forever. Tacia and Gabe’s ceremony was set for 7 pm, and the late afternoon light was so soft and lovely in the garden. It was wonderful to watch all their friends and family gather for this precious ceremony. 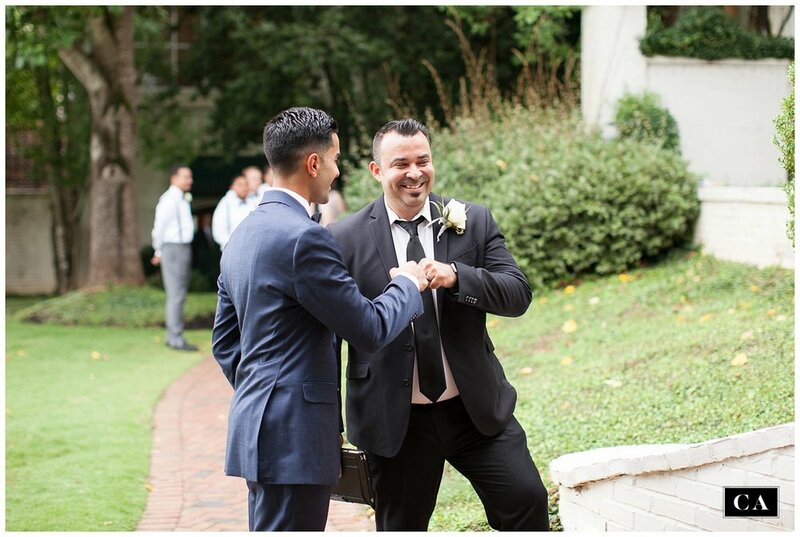 And even though Tacia and Gabe had shared a First Look earlier in the day, when Tacia came down the aisle, the expression on Gabe’s face was as if he was seeing her for the first time, all over again. 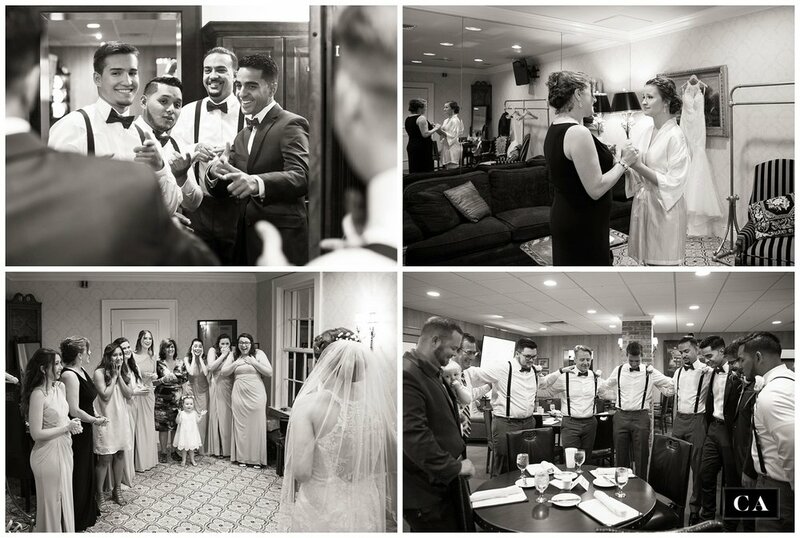 Tacia and Gabe’s ceremony was full of sweet, heartwarming, and funny moments! 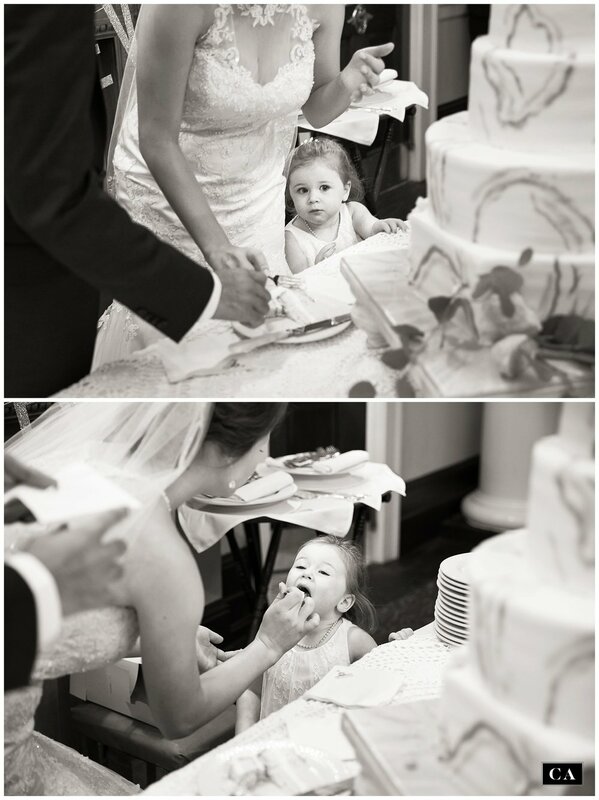 I giggled at their little flower girl’s expression when she came down the aisle. I teared up when Tacia’s dad took a moment to bless them before he presented Tacia to Gabe. My heart overflowed with joy as I watched Tacia, Gabe, and all their family, friends, and guests sing a song of praise to the Lord together. I teared up AGAIN as I listened to them read their letters to one another (and I wasn’t the only one crying!) 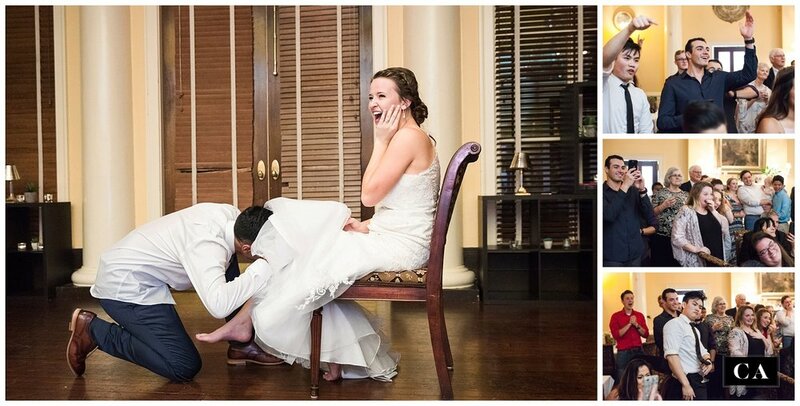 I laughed when I saw how their friends reacted to their first kiss! And I was completely charmed when they presented bouquets to their moms at the end of the ceremony. But one of my most favorite moments happened as they walked out! Their tiny flower girl, Tacia’s little niece, ran after them as they walked out, saying “Hey guys! Wait up!” in her little baby voice! She didn’t want to be left behind! 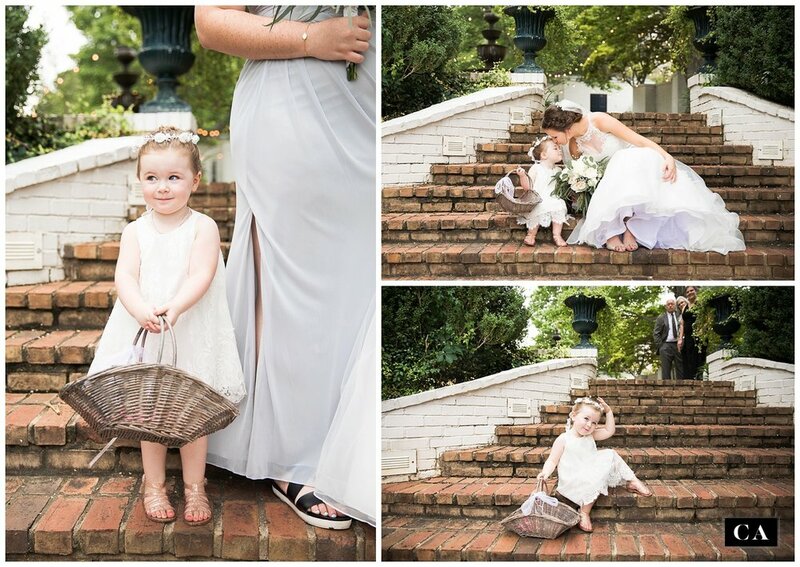 She RAN down those steps and had to get ONE MORE KISS from her Aunt Tacia! It was the sweetest thing, y’all! As the warm June sun set outside, the party moved indoors. 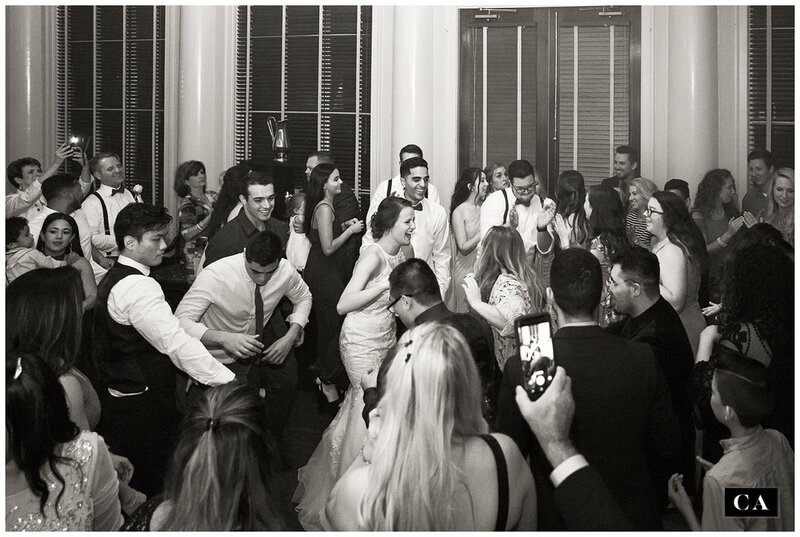 And y’all, WHAT A PARTY IT WAS!! 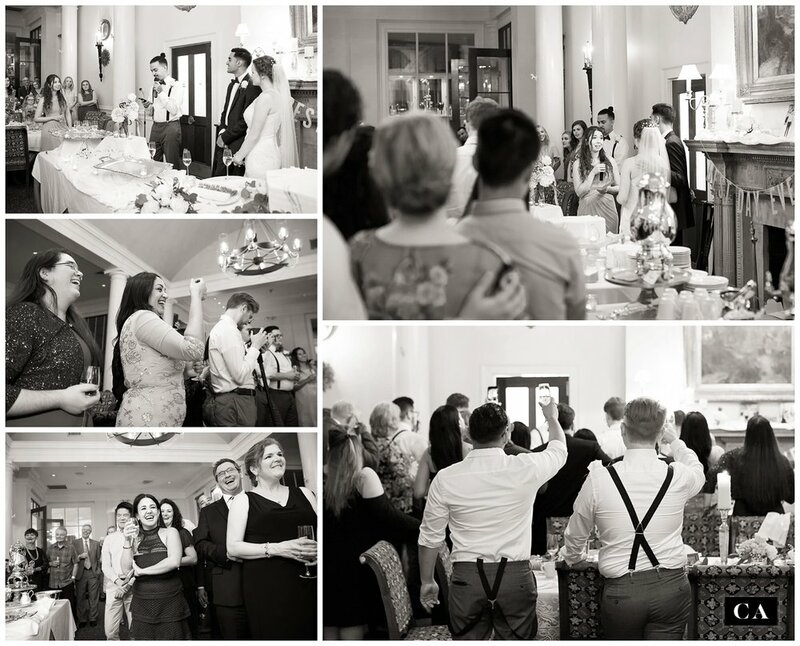 The Clubhouse was full of creamy roses, greenery, and candlelight. A lovely, elegant marbleized wedding cake was the centerpiece of a long table full of flowers and glasses of sparkling grape juice topped with yummy strawberries. 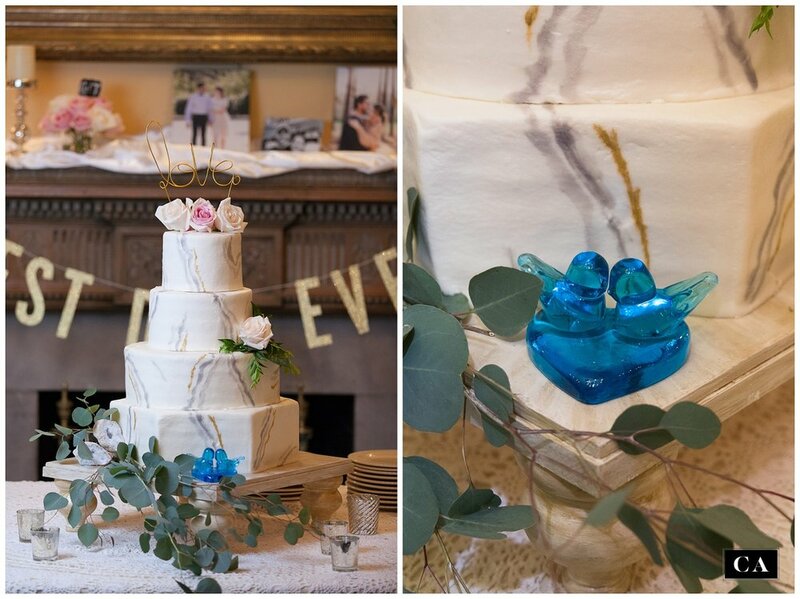 Bluebirds of Happiness figurines by Terra Studios have a very special meaning in Tacia’s family, and I was so happy to find a little pair nestled at the foot of their cake! 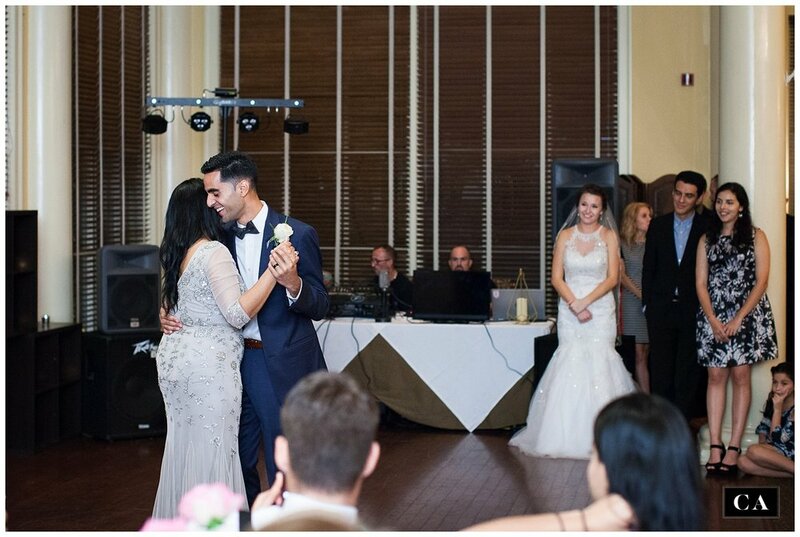 I need to stop here and say something about this First Dance. Tacia had hinted that she and Gabe were planning something special, and oh my gosh, these two OWNED it. I wish I could embed a video here so you can see it! It was romantic and fun and playful and passionate. In short, it was perfectly THEM. And the dancing. Oh, the dancing. It makes me so happy when people express their happiness through dancing. I LOVE to dance, but my skills peaked during my Zumba classes a few years ago! Gabe and his friends and family have REAL skills, and it was an amazing experience to watch them on the dance floor! This party didn’t stop til we HAD to leave, y’all! And the last few group portraits Tacia and Gabe took with their friends and family at the end of the evening are some of my forever favorites! Remember that vintage Volkswagen Bus I showed you earlier? The one that served as the cutest photo booth? At the end of the night, it got to be Tacia and Gabe’s getaway car! These two left their wedding day under the glow of a hundred sparklers, surrounded by happy cheers and so much love! 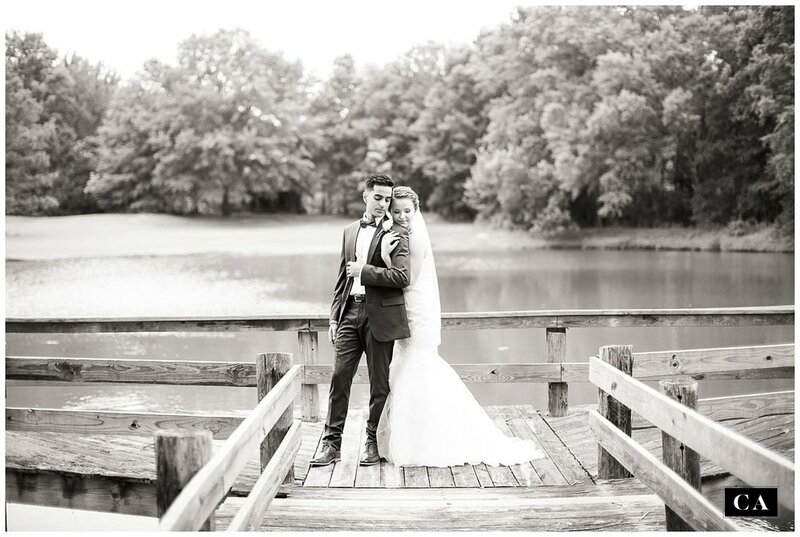 Tacia and Gabe, it was such an HONOR and so much FUN to witness your happy day! Jonathan, Eli and I will always cherish these amazing memories! We can’t wait to see where God leads the two of you!